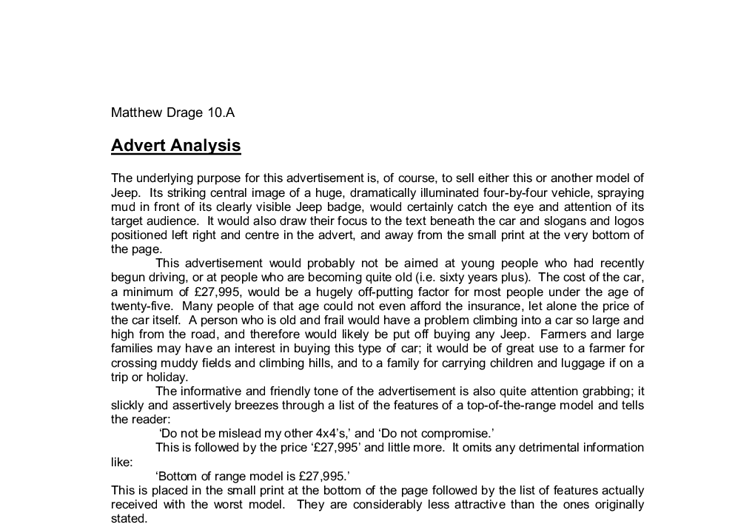 Matthew Drage 10.A Advert Analysis The underlying purpose for this advertisement is, of course, to sell either this or another model of Jeep. Its striking central image of a huge, dramatically illuminated four-by-four vehicle, spraying mud in front of its clearly visible Jeep badge, would certainly catch the eye and attention of its target audience. It would also draw their focus to the text beneath the car and slogans and logos positioned left right and centre in the advert, and away from the small print at the very bottom of the page. This advertisement would probably not be aimed at young people who had recently begun driving, or at people who are becoming quite old (i.e. sixty years plus). The cost of the car, a minimum of �27,995, would be a hugely off-putting factor for most people under the age of twenty-five. Many people of that age could not even afford the insurance, let alone the price of the car itself. A person who is old and frail would have a problem climbing into a car so large and high from the road, and therefore would likely be put off buying any Jeep. Farmers and large families may have an interest in buying this type of car; it would be of great use to a farmer for crossing muddy fields and climbing hills, and to a family for carrying children and luggage if on a trip or holiday. ...read more. The futuristic design would certainly appeal to a younger generation; most young people want to keep up with new technology, and do not want to be left behind. This advertisement is appealing to that, and reinforces it by repeating the slogan 'Moving into a new dimension.' Taking up most of the advert is a large central image of a trendy minimalist room painted in a cool pastel blue, with a sleek silvery television on glass stand in the centre of the room, and a hand gesturing towards it from the extreme left of the page. This picture of a fashionable room would make the advertisement even more appealing to the target audience. To the left of the television is the slogan 'Sharp LCD T.V. Moving into a new dimension'. Small text below describes authoritatively, factually, and with a certain degree of assertiveness all of the positive aspects of the television; it is described as 'A mere 6 centimetres slim.' This implies that 6 centimetres is very thin for a television, and most readers would take this at face value, and not stop to think about how thin it actually is. It is very certain about the quality of the T.V; it states that it 'Delivers you unparalleled picture quality' and that the available sizes, 17", 19" and 21" are 'Enough for any room in the house. ...read more. This is followed by a similar paragraph summarising the whole advertisement; 'We'll give you the latest 3310 handset with 500 text messages (worth �60), absolutely free. Add that to 500 minutes of off-peak calls every month, and now you're talking.' This final phrase uses the common figure of speech 'Now you're talking.' This is being used literally, saying that if the reader buys their phone they will be talking on it, and in its figurative sense implying that the reader is being offered a good deal. This is followed by the order for readers to 'Call free now on 0800 759 759.' Many readers would take notice of this somewhat impertinent command and do as it says. To the left of this text is a table showing the pricing of various networks compared to theirs. Their own prices are highlighted in an attempt to take the readers attention away from the other network's deals, which in some cases are better than the one advertised. Positive selection like this is used throughout the advert. The list of supposedly free features seems to avoid the fact that they are only available if �12.50 per month is paid, and even if it is some of those are only available to the customer for 10 months. Much of this detrimental information is only stated in the very small print at the bottom of the advertisement. ...read more. They have done this because she is the image that is most likely to attract the audience. The text is at the top left hand corner of the page and the bottom right hand corner of the page. This creates balance for the eye. His mouth is open implying that he is talking and can make him look desperate and shut out from the way in which he is placed in the advertisement. A pinafore is usually worn with a dress by women of an older age for household chores, but this man is wearing it on its own and doing the washing up. C-C�- (Approximately 8%). 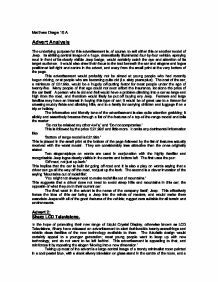 Group C� is lower middle class. These are white-collar, white-blouse office workers. They mostly use their phone during peak hours and are often mobile-to-mobile. Marks and Spencer will try to push for this type of customer as they use their mobile phone a lot. Under the ACORN system or rating I will target four specific ACORN types and two ACORN groups. My chosen advertisement is extremely well presented. The page is separated or split into two, each half presenting a different image. Both images are photos of the same young boy but they differ in presentation. The top image portrays a very dirty and poverty stricken boy who has an incredibly forlorn and distressing expression on his face.